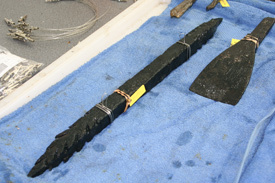 As many of you know this summer has yielded many artifacts on both the Atocha and Margarita sites. Because of this our Senior Conservator, John Corcoran has been extraordinarily busy taking care of the many items the boats have been bringing in. There have been numerous Encrusted Objects (EOs) brought in; which are items that have a thick concretion on them and we are unsure of what exactly they are before conservation. It is John’s job to determine if the artifact is salvageable or if it has already completely eroded away while sitting on the ocean floor. In this case it is better to use the encrustation as a mold for a replica of the original artifact. This past Sunday John was working overtime to keep up with the large volume of artifacts in the lab and began the conservation of a few quite remarkable encrusted objects. 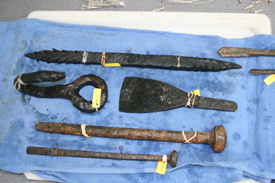 The encrustation was removed from various carpentry tools found on the Atocha wreck site; which may indicate that we have found the carpenter’s section of the ship! 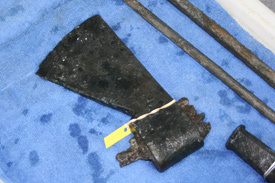 Among the tools were two iron claw hammer heads, iron-drilling tools, an Adze that was used to shape wooden beams, a cargo hook used for loading cargo onto the ship as well as an axe head. 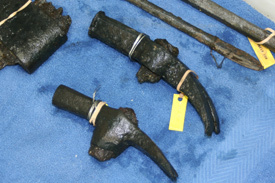 Another interesting item that was uncovered, which is not a carpentry tool is a bar shot which was shot out of a cannon in order to tear down the rigging of a rival’s ship. According to John the finish on these items are nearly perfect and appear as if they had just been made. Check out the pictures and see for yourself! 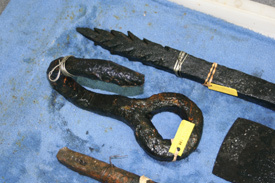 The Cargo Hook (center) is in great condition. 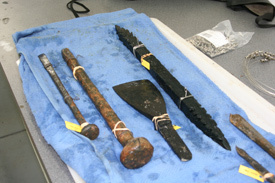 Assorted items include a Cargo Hook, Bar Shot, an Adze, two Pins, and the tips of two drilling tools. 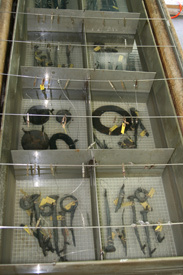 Numerous assorted artifacts in the electrolosis tank. 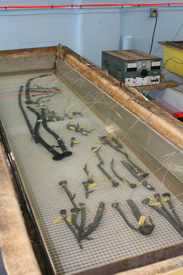 Spikes and pins of various sizes undergo electrolosis. The Bar Shot still looks very intimidating. It's always amazing to find artifacts in such great condition.